Buying guide: Which iPhone should you get? The demise of the iPad 2 isn’t the only change Apple made to its product offerings on Tuesday. While it’s not available in the U.S.—currently, anyway—some of Apple’s international stores are now quietly offering an 8GB version of the iPhone 5c. The model, which is available in several European countries (the UK, France, and Germany) as well as Australia and China, seems to come in at about 8 to 9 percent cheaper than the 16GB model. Of course, in most of those countries Apple sells the Phone unlocked and unsubsidized by local carriers, meaning that the prices are much higher than what those of us here in the U.S. are accustomed to. But the price difference between the 8GB and 16GB in most places seems to be much smaller than that between the 16GB and 32GB models, leaving many to wonder about the appeal of the 8GB model. For example, in the UK, the 8GB model is on sale for £429 (about $712), the 16GB for £469 ($778), and the 32GB for £549 ($911). Meanwhile, the 8GB iPhone 4s sells for £349 ($579). An 8GB device is rather on the limited size for most users, when it comes to media, photos, or even apps. (Personally, I have enough trouble managing space on a 16GB iPad mini.) 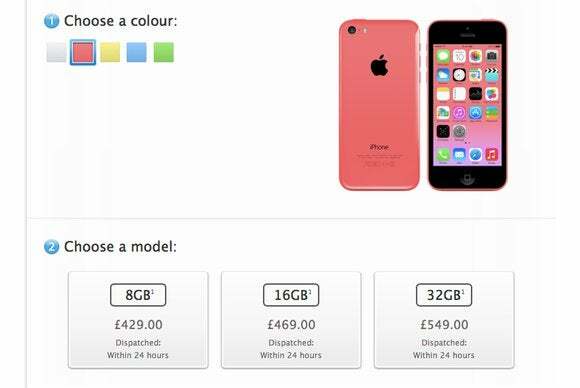 Given that the iPhone 4s is likely to be the model that appeals to the truly budget-conscious customer, it’s hard to peg exactly who the 8GB iPhone 5c is for. While Apple may be hoping that the cheaper price for the newer model gets customers in the door and provides the opportunity to sell them up to the 16GB model, the price cut doesn’t seem aggressive enough to attract a bevy of new customers. It’s also not unlikely that Apple has targeted certain countries as places where a slightly cheaper iPhone 5c will find some traction. In particular, the inclusion of China—one place Apple has been aggressively trying to boost iPhone sales—suggests that the company is deploying the 8GB model where it may make the most difference to its bottom line. As for whether the 8GB model will find its way to the U.S., it’s unclear. By most accounts, the iPhone 5s has been the far more popular of the two models Apple introduced last year, but Apple could try and drive more customers to the iPhone 5c by introducing the 8GB model at a $49 price point halfway between the free (with contract) 8GB iPhone 4s and $99 16GB iPhone 5c.